It was an earlyish start for me and Paul this morning, but we felt that it was a welcome start, as we chewed listlessly on the worst breakfast yet. Hotel Lincoln reached new lows with their soggy aubergine and cheese surprise, so much so I had to spit it out. The bus picked us up shortly after 8am and proceeded to drive slowly around Havana for the next hour, picking up other people from outside posher hotels than ours. Rather than lamenting the lost hour of sleep, I stared out of the window, contemplating my surroundings. Outside the Hotel Inglaterra, a policeman moved on a barefooted local who looked like he could have been homeless. In a society where everyone is meant to be given a home, but where there aren’t really enough homes to go round, I was unsure as to whether this could be the case… yet it seemed that anything was possible in this less-than-perfect reality. Nearby, another local was chatting to some tourists while his accomplice stood away from the scene and quickly sketched them- I wondered if they were aware of this, or whether they’d be taken by surprise when they were pressured into handing over cash for the rapidly scribbled likeness. Around the corner, a Che look-alike paced up and down like a big issue seller, peddling copies of the propaganda-filled communist newspaper, whilst sucking authentically on a big fat cigar. More tourists piled onto our bus until it was almost full. 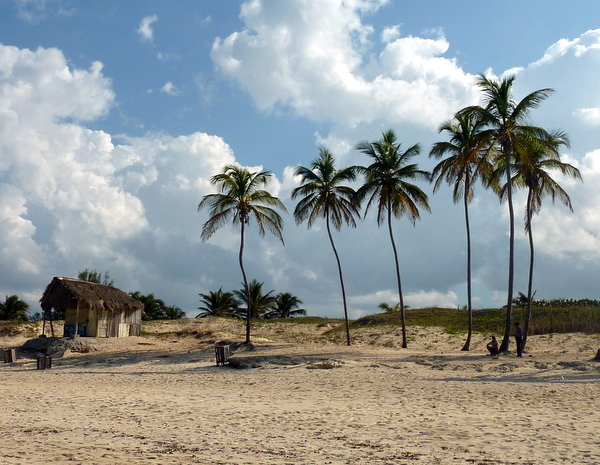 Finally, we drove out of Havana through untouched countryside (well, apart from the big fat road running through it). Clusters of locals appeared sporadically at the side of the road, often accompanied by an official, whose job it was to enforce the ‘you have to pick up hitchhikers if you’re Cuban and there’s room in your car’ law. As the morning wore on, my thoughts turned to the fact that we hadn’t booked any accommodation for the evening, so I looked to my guide book for comfort, which assured me that, with over 400 casas in the small town of Trinidad, we’d be spoilt for choice. “Do you know what the casa sign looks like?” I asked Paul, referring to the sign I had read that casas have to display on the door of their house by law. “No,” he replied unhelpfully, leaving me to nervously hope that we’d recognise it when we saw it upon arrival in Trinidad. Arriving in Trinidad is like driving into a painting. We rumbled over ancient cobbles, behind horse drawn carts amongst peeling pastel painted buildings. The Lonely Planet suggested that it would feel like we’d been transported back in time, but Trinidad delivered one step further by transporting us into an artist’s fantasy. After securing a casa for the next few nights from one of the aggressive touts who wouldn’t leave us alone until we agreed to go with them, we explored the cobbled streets with a bounce in our steps. In spite of the scores of people offering us cigars, taxis and chances to take photos of a man with a chicken on his head, it felt like the weight of an aggressive Havana had been lifted, and we had finally landed in a place where we could enjoy our time on our own terms. We headed back to the casa in time to watch the sunset from our private rooftop terrace. Day three was already upon us and it was time to start making some decisions. 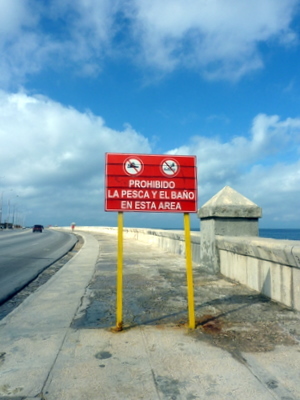 On a two week trip, there isn’t much time for faffing about if you want to get out of Havana, away from the jinter@s who spent their days negotiating and conning money out of naive tourists. After much deliberation and consulting of maps and timetables over another dry tasteless breakfast inside the crumbling walls of our hotel (Jon bravely tried the ‘brown’ juice, and we’re still none the wiser as to what flavour it was meant to be…), we came to a decision. This is no easy task when there is no Internet to help you out, in a country where foreigners are most certainly not encouraged to go off the beaten track, or even to venture away from the cocoon of all inclusive state run hotels. So it was decided that Paul and I would escape Havana the next day and make the 6 hour bus journey to Trinidad, while Jon and Robin opted to keep Yvonne company on the nearby beaches and join us a day later. That done, we got the bus to the beach. After a 30 minute journey, it dropped us off along a road which was lined with all inclusive hotels, behind which we found the pure white sands and pure turquoise sea of the Caribbean. Under the warmth of a glowing sun, light danced like sparkling diamonds on the crests of the gentle waves. We selected a quiet spot, a short walk away from the beach-side bars where you could buy rum filled coconuts to sip on as you watched a local band tap out rhythms against the backdrop of clichéd Caribbean paradise. 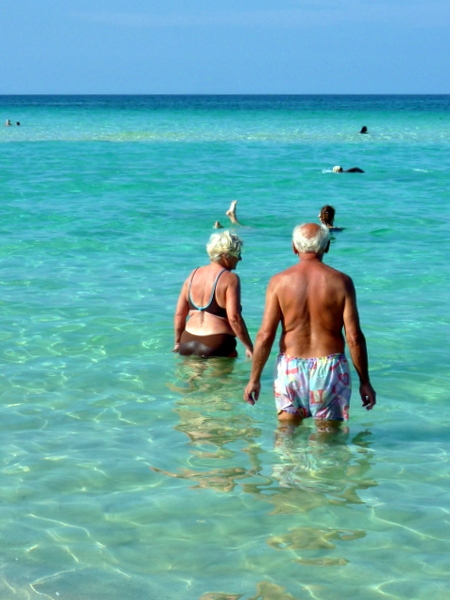 We passed a relaxing day lying out in the sun, occasionally dipping into the cooling ocean for a splash around until it was time to wrestle a place on the overcrowded bus back to Havana. That evening, hopes of a night on the dancefloor were soon quashed after dinner and a beer, as Jon’s jetlag prevailed and we headed back to Hotel Lincoln for another early night. While Robin and Yvonne opted to move on to find somewhere they could sit on a beach for the next five days, us three newcomers took a stroll along the Malecón in search of a statue of Lennon, because we’d no doubt be sick of the sight of Lenin before we left the country, and so a statue of a bloke from Liverpool would help to break the monotony before it had even started. 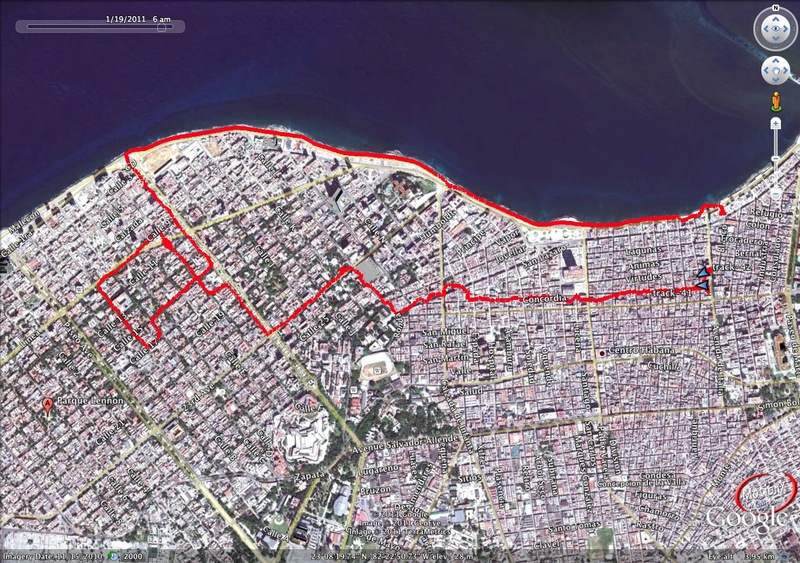 After a few miles we crossed the road and entered the residential and ex-mafia area of Vedado where the streets were lined with scruffy trees and overgrown patches of grass which gave the city a whole different feel to the other areas we’d so far visited. It was at our refreshment stop that we learned to ask the price of things before we ordered them from the pretty friendly ladies in the cafe. In fairness to the pretty ladies, they knew what they were doing – making sure they identified which of the two men I was with was my boyfriend before homing in on the one who wasn’t my boyfriend with flirtation and flattery. It was only when they offered to get us more drinks, and maybe a sandwich, and the boys were debating whether to stay for another or not that I pointed out that we hadn’t found out the price of our beers yet and would probably wise to get the bill and go somewhere less ‘friendly’ with a visible menu. While I was in the toilet, Paul and Jon sorted out the bill, and chased Barbie the waitress for their change, and then again for the bit that she tried to short change us before we made a hasty exit. At Coppelia, we paid over the odds for a bit of ice-cream. If we were willing to queue for 2 hours, we probably could have got it for local prices, but as it happened, we couldn’t be bothered, so allowed ourselves to be herded around to the tourist bit where its acceptable to jump the queue in order to eat ice-cream from a place that was in a film once. That evening, we considered taking in the matinee at the Casa de la Musica, but ended up going out for dinner at a paladar which put chili sauce on the table (much to our excitement) and served cheap food that was almost tasty. And then we found an Austrian bar where you could order beer in 3 different colours, or, if you so desired, in a giant tube, whilst listening to the resident band tap out rhythms on their congas. I’d heard so much about Cuban food before I got there… how bland it is, how fried it is, and generally just how terrible it is, that I was almost impressed with my beige buffet breakfast of hard, yellow rice, dried out beans, an over-cooked egg, spam fritters, fresh pineapple that somehow managed to taste tinned, and soggy cake. Robin and Yvonne on the other hand, had been there for 4 days and so were anxious to find something just a little bit tastier which is why we set out that morning to find La Guarida, Cuba’s only internationally recognised restaurant. Stepping onto the streets for the first time in the daylight gave a much more accurate impression of Havana, with the buildings brightening up the streets- their faded shades of pastel were occasionally embelished with bright orange streaks where rust had crept down from the metal which gave birth to it, and onto the painted, flaking buildings below. Every so often, a cage would appear in the wall of a building where a man or lady stood selling coffee or substandard sandwiches and everywhere, Cubans sat out on doorsteps, watching the world amble by. At the top of a peeling staircase in a residential building we walked into La Guarida to make our reservation for dinner. At 10am we were just about early enough. On our way back to the Old Town a woman walked close enough to covertly get my attention. She asked for a pen, whilst motioning with her hands as if writing in case I didn’t understand, so I dutifully reached into my rucksack and handed over a biro, which she gave an appreciative look before concealing it on her person and hissing the word ‘jabon? But I didn’t have any soap, so he hurried away from us, pretending that she had never broken any rules by speaking to a tourist. Around every corner, a new smell – from exhaust fumes to rotting rubbish, from urine to petrol leaking from a car, and of course, that unmistakable smell of fried stuff. On the way to barrio Vieja – the old town we stopped to experience our first Cuban mojito (not as good as the ones I make at home!) and our first attempted short-change. 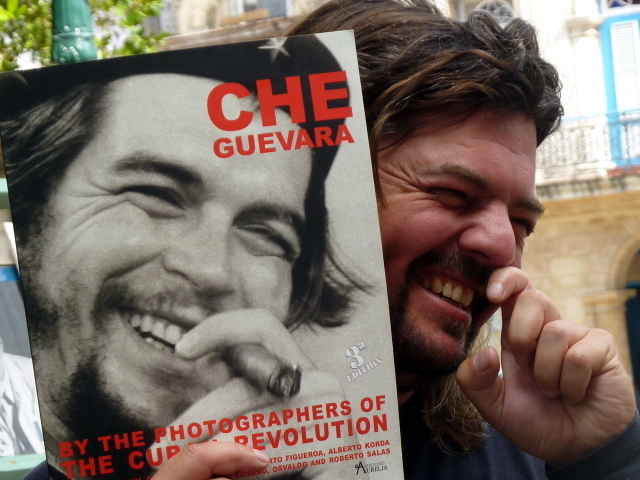 A stroll around a second-hand book market revealed that we were in fact with Che Guevara, who we managed to lose as we followed the sounds of Cuban percussion and brass to another open square at the end of which a salsa band was playing to an audience which was seated on the terrace of a restaurant. “Let’s dance Jon!” I said. 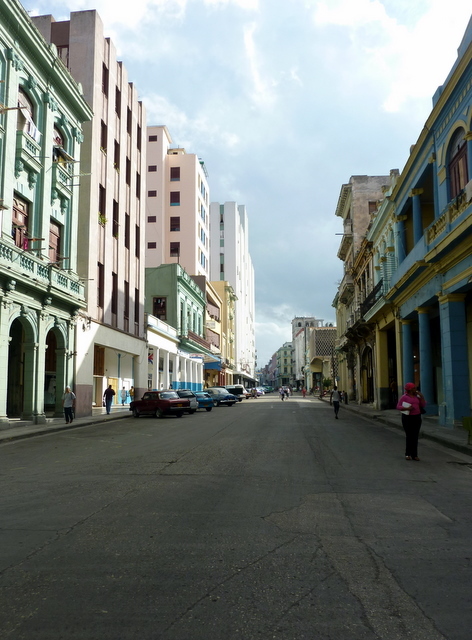 We’d been in Cuba for more than 12 hours now and the music, which oozed from every building, and every crack in the pavement was something that salsa addicts can never resist for long. 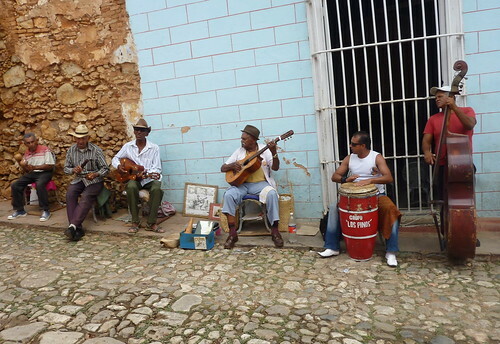 Under the heat of the midday sun, on the cobbles, with backpacks still firmly strapped to our backs, we played at dancing until a ‘typical Cuban’ intervened and showed us how it was really done. Having seen him pose with tourists with a big fat cigar in his mouth, we knew he was just after our tourist money, but we indulged him in an impromptu lesson before handing him a peso (in place of the 5 he asked for) before moving on. Down one of the main streets, the sound of a live band drew us into a cafe for something to eat and the second mojito of the day. Every now and again the band members came round to collect money in return for the entertainment and to covertly offer us some cigars… The fact that he looked like a Cuban Del boy didn’t help the fact that his attempt at being ‘covert’ was almost comedic. Yvonne took a picture of him to remind her to the time she met Cuban Del boy- which he posed for, but then came back to make sure that she didn’t mention cigars if she ever put the photo on the internet. ‘I’m a musician” he declared, “and nothing else. I will get in trouble if you mention anything about cigars.” In Cuba, Big Brother is always watching you. Later, after a quick nap back at the hotel, we headed out again to find somewhere to take in our third mojito before dinner. As we wandered down one of the streets, we spotted a group of people crowding around a doorway. “I wonder what’s going on there?” said Robin. “Huevos.” Called out a man as he hurried past us to join the hustle. Word gets around fast in Havana. If a shop gets some eggs in, people find out about it fast. 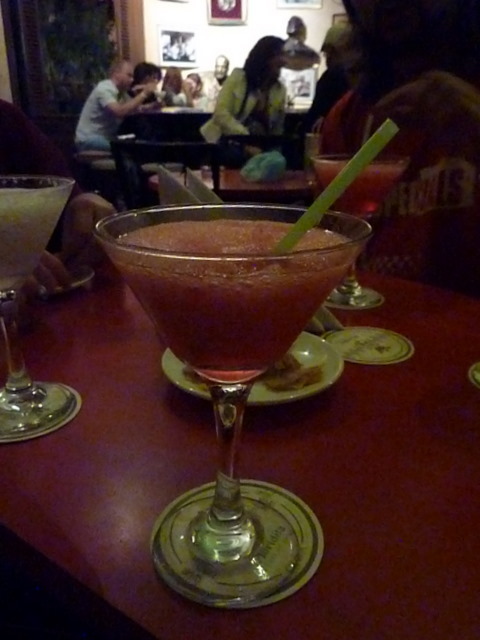 And finally, it was back to La Guarida, for dinner. The restaurant sits on the top floor of a deceptively dilapidated building, but behind its sought-after doors are three cosy rooms, crammed with tables of tourists who are sipping on a glass of house wine, or cocktails, chomping on unusually well-cooked and flavourful food. As we enjoyed our meal, we were almost oblivious to the storm which lashed the streets outside – only making its presence known to us through bright flashes of lightning. We ran back to the Hotel Lincoln once the thunder had eased off, but still climbed into bed soggy from the continuing downfall and tired from our first full day in Havana. For some reason, whenever I have to get up at 4am to catch a train, to catch a plane, to catch another plane to go to Peru, or in this case, Cuba, I go out dancing the night before, roll into bed three hours before the alarm is due to go off, and worry about finishing off the packing in the morning. Today was no exception. In spite of my attempts to catch a few zeds on the train, I arrived at Manchester airport tired and disheveled and dressed in the very same clothes I wore to go to Peru just 4 months ago, finally feeling some sort of anticipation and excitement about the chance to explore a new country. I was dressed in my travelling uniform and ready to go. After a long time in a plane which provided in-flight ‘entertainment’ of an episode of Jamie Oliver cooking the same thing over and over again, we finally flew over Cuba past an orange sun which was setting in the Caribbean sky, before dipping below the clouds to land at José Martí airport. As the taxi drove us through the palm tree lined streets, past crumbling one storey buildings amongst ancient Ladas, Fords and Chryslers, and other blasts from American car past, it felt as if we had stepped back in time, with only the high-tech traffic light countdown displays to remind us that we were still in the 21st Century. 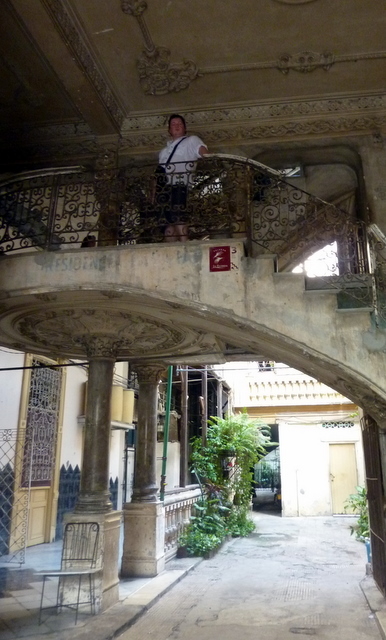 On the 5th floor of the rotting Hotel Lincoln, we showered and changed before heading out for a first glimpse of Central Havana which appeared almost monochrome in the dimly lit calles where street lighting is an apparent rarity. Before long, we were sipping on our first cocktail in the renowned Floridita where Daquirís are pricey because you can drink them in the company of a brass statue of Ernest Hemmingway and a 4 piece band, who are squashed into a small space behind the door, playing Chan Chan and Guantanemera, just to remind you that you’re definitely in Cuba now.